When you’ve lost a tooth that shows when you smile, it can be emotionally traumatic. However, new technology enables us to make a tooth replacement that looks and feels like the real thing. 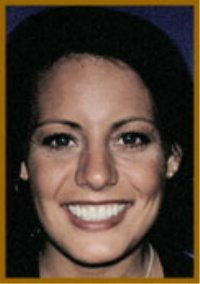 If you want your dental bridge to look perfectly natural, choose a dentist who is schooled in these new techniques. There are three basic ways to fix a missing tooth. To read a discussion on the three options, please see our page on missing teeth. This page will deal with one of those options – a fixed dental bridge. The other two options are a dental implant or a removable denture, which can be either a full denture or a partial denture. When I was in practice, the principal technique I used to get bridgework to look natural was the ovate pontic. This is a technical term for a method of creating the illusion that the tooth is growing out of your gum. There aren’t many dentists yet who use this technique, outside of those who are trained in cosmetic dentistry. However, use of the ovate pontic technique is required of cosmetic dentistry specialists who are taking their accreditation exam. When an ovate pontic is used as part of a dental bridge, the site where the false tooth is placed is sculpted with an electrosurgical device prior to placing it. This creates the illusion that the tooth is growing up from the ridge. That technique has been used in the photographs below right and at the bottom of this page to give the lateral incisors in each case such a stunningly realistic appearance. This is work that was done by Dr. David Hall, author of this site. Here is a photograph of teeth prepared for bridgework, with the sculpted ovate pontic site. Here are the same teeth, with the bridge in place. This type of bridgework creates the illusion that the tooth is growing out of the gum, when it is actually a false tooth. Work performed by Dr. Hall. Here is a bridge done by a mynewsmile network dentist, Dr. Ross Headley of Overland Park, Kansas. The patient had an old Maryland bridge and a lot of tooth decay. This bridge wasn’t done with the ovate pontic technique, but it still looks very natural. The bridge is all-ceramic, and the colors, shapes, and translucency are matched perfectly throughout her smile. For more information on Dr. Headley, click here. Heather, with her old Maryland bridge and tooth decay. Click on the image to see a close up of her smile. 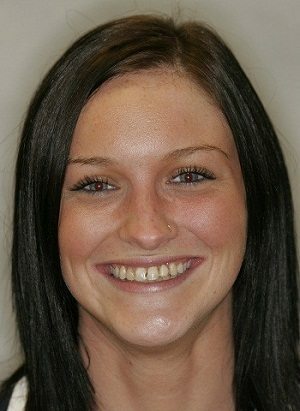 Heather, with her new all-ceramic bridge and porcelain crowns by Dr. Ross Headley of Overland Park, Kansas. 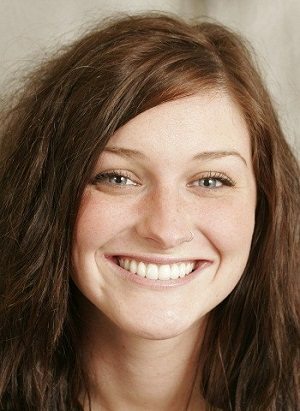 Click on the image to see a close up of her new smile. We have a photograph of another beautiful dental bridge placed by Dr. Thomas Dudney. Here is another case of a very natural-looking bridge. 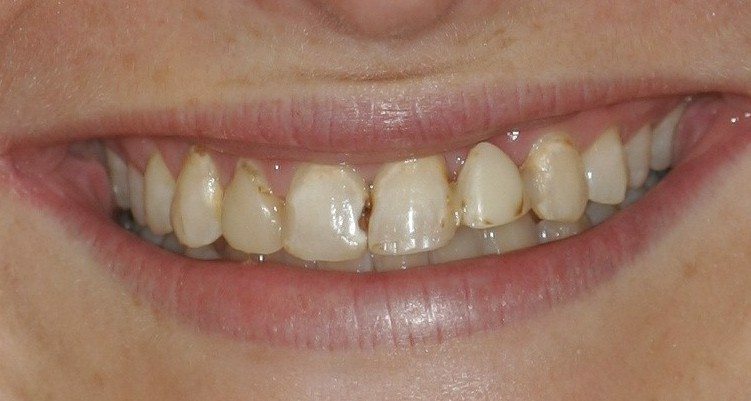 This work was performed by Dr. Steve Gorman of North Oaks, Minnesota, one of our mynewsmile.com network dentists. 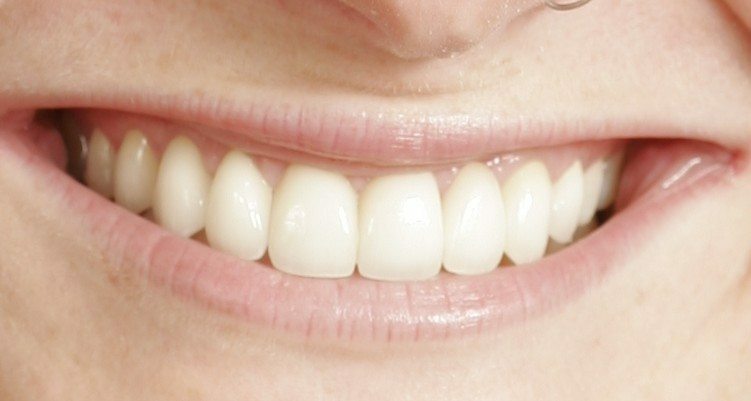 In this case he has placed an all-ceramic bridge combined with porcelain veneers on the remaining front teeth. Notice how absolutely natural-looking the final result is. Click here for more information about Dr. Steve Gorman. Sometimes a patient’s jawbone has shrunk and an ovate pontic isn’t practical. In the hands of an expert cosmetic dentist, the patient can also get a beautiful bridge. Another type of bridge is the Encore® bridge. Please see our Encore® bridge page for more information. The Encore® bridge is conservative—that is, not much of the surrounding teeth has to be drilled away, and it is extremely esthetic, as you will see from the photographs. Read more about dental bridges in the posts on our cosmetic dentistry blog. A Maryland bridge is similar to the Encore®, but it has a framework made of metal, which causes some esthetic problems. A dental flipper is the least expensive tooth replacement you can get. Sometimes it is used as a temporary dental bridge.